Pair of teens points BB gun at police. Matt O'Donnell reports during Action News Mornings on January 11, 2019. RIDGELAND, Miss. (WPVI) -- A pair of teens was reprimanded by a family member after pointing a BB gun at a police officer in a Mississippi parking lot. 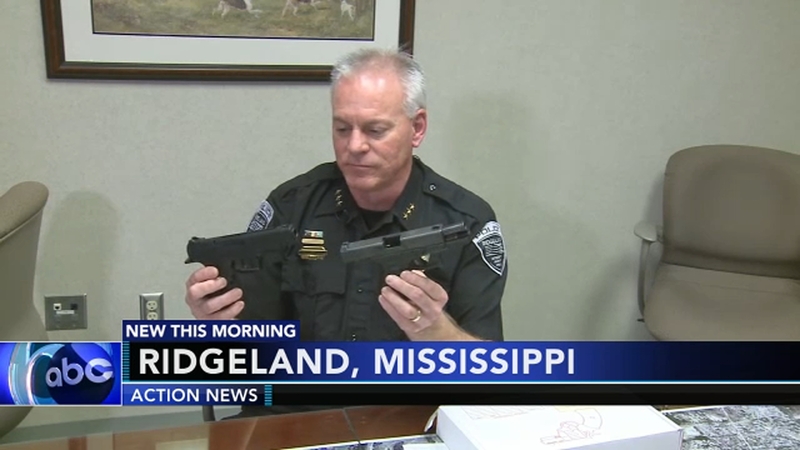 The encounter was recently captured on dashcam video by the Ridgeland Police Department. The police officer did not reach for his gun, but did detain the teenagers until the grandfather of one of the teens came to get them. Police say the grandfather scolded the teens, 15 and 17 years old, and that, too, was captured on dashcam video. Police Chief John Neal says what he saw on that video scared him. "Because one of (the teen's) comments was, 'We weren't gonna hurt anybody with it. We weren't gonna scare anybody with it.' So, they don't really truly understand what they're carrying around in their hand, the impact that that toy gun could have on their life," Neal said. Later at police headquarters, Neal illustrated just how much a toy gun can look like an officer's service weapon, holding them side by side.